Carrabelle is known for its vast variety of recreation. Bordering Tate’s Hell State Forest, Carrabelle has some of the best hunting, fishing, hiking, and camping locations around. For more information on obtaining hunting and fishing licenses, nature trails and campsites contact the Florida Wildlife Commission. For the canoe and kayak enthusiasts, Carrabelle is on the Florida Circumnavigational Saltwater Paddling Trail which has received the National Recreation Trail designation. 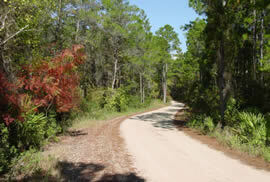 If you would rather drive, Carrabelle is a member community of the Coastal Trail of the Big Bend Scenic Byway. Franklin County has amazing wildflowers to enjoy. Click here to download a pamphlet featuring viewing routes, a brief history of wildflowers, tips for best viewing, and beautiful photos and descriptions of 40 common regional native flowers. The birding opportunities are extensive, many Carrabelle locations are on the Great Florida Birding & Wildlife Trail.